rec. 8-11 December 2015, Kleine Audioweit, Sandhausen, Germany. What is it about Vivaldi’s music that brings out so much life and vitality from musicians and recording engineers alike? This selection of Vivaldi oboe and bassoon concertos is certainly no exception. The playing by this Mannheim-based group, who appear to use modern instruments, is absolutely first rate and the recorded sound gloriously full-bodied, balancing the instruments of oboist Simon Fuchs and bassoonist Matthias Racz and the 16-member ensemble to perfection. To take a single track as an example, the finale of RV 461 trips along with delightfully mischievous playfulness, the lute of Emanuele Forni giving it an almost jazz-like vigour, and all of this is caught in bright, vivid sound. Johannes Schlaefli keeps the tempi brisk – indeed, that RV 461 movement is certainly more of a Vivace than the stipulated Allegro – and while this makes for some wonderfully energetic playing and displays to the full the collective virtuosity of the players, after a time it does begin to wear a little thin; the finale of RV 484 has an almost manic energy about it. While no Vivaldi concerto movement is so long that it can ever be said to pall on the ears, such unflagging cheerfulness does becomes vaguely irritating after a while. How welcome, therefore, that Schlaefli takes Vivaldi at his word with the Allegro non molto first movement of RV 457. In the slow movements, he again aims for the brisk, business-like approach, avoiding any sense of wallowing in Vivaldi’s often enticing melodies, and highlighting the frequent use of driving bass figures. There is, however, no discernible difference between the stepping bass of RV 493’s Largo, RV 457’s Andante or RV 461’s Larghetto; tempo indications may all be subjective, but some character difference would seem to be in order to distinguish between these slow movements. Tempi aside, Schlaefli’s interpretations are mercifully free from idiosyncrasies, and I particularly admire his elegant shaping of phrases in the tuttis and the way in which he uses them so effectively to pave the way for the entries of the soloists. Continuo playing, shared between Forni’s lute and the harpsichord of Martin Zimmermann, is delightfully discreet, rarely impinging on the performance other than to give it feeling of engine-room support. Bass lines are always nimble and fleet-footed – I particularly like the delicacy with which the bass and celli introduce the first movement of RV 453. The bassoon concertos are particularly well represented in the catalogues, but Matthias Racz is a serious contender with some tremendously agile and articulate playing giving vent to a strongly stylish interpretation. His virtuosity is best displayed in a bubblingly effervescent account of the opening movement of RV 484 with its sudden and unexpected changes of direction and its leaping across the instrument’s range. Simon Fuchs is a very polished and often smooth player, agile and nimble in the Allegro movements and richly lyrical in the slow ones. His beautifully moulded line in the slow movement of RV 453 is so beautifully contoured that has all the allure of a gentle bed-time story. The disc ends with one of Vivaldi’s double concertos, bringing together the two opposite ends of the woodwind spectrum. 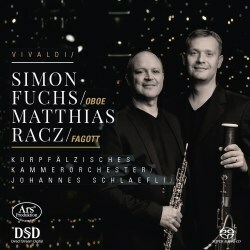 In the first movement Fuchs and Racz are left to indulge in their dialogue passages unsupported by even the slightest of nudges from the continuo, while in the central Largo the oboe describes a florid melody with gentle touches from the continuo and an elegant counterpoint from the bassoon. The concerto ends with a typically breathless romp which, at Schlaefli’s very fast speed, tests virtuosity to its extremes. Both Fuchs and Racz pass the test with flying colours as does the ever-alert orchestra.